Engraved In The Coal-Rich Mountains Of Pittsburgh, KSWA Unveils Its "Franchise Four"
Much like the All Star special, fans voted for their favorites. In the KSWA, the Krazies suggested a diverse, qualified field with Jay Flash, Jack Massacre (himself a true mountain of a man), La Lucha, Anthony Alexander, Jester, Shane Starr, Mike Malachi, and Frank Durso. Some selections—see The Great Toyota—were playful jokes, but others like Mayor Mystery’s choice of his current stable (J-Ru, Bobby Badfingers, Nick Crane and Sniper) were as serious as a falls count anywhere match. Ultimately it was a combination of the fan’s votes and choice of the Championship Committee as whose profiles were to be engraved on the faux mountainside, most likely located at the West End Overlook, roughly 1,200 feet above sea level and 600 feet above downtown Pittsburgh. 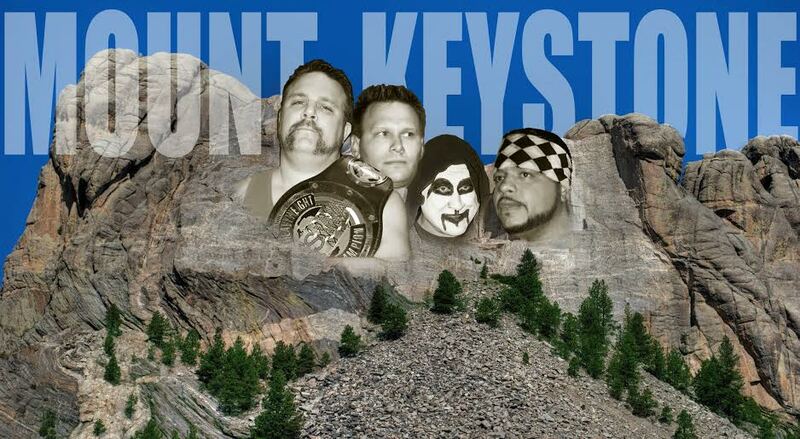 Unquestionably, the first face emblazoned on Mount Keystone is the current, reigning and record-extending 6-time KSWA Heavyweight Champion, Shawn Blanchard. A founding member of the KSWA and VIPs, Blanchard has held the organization’s top championship more times than anyone. In fact, it is daunting to find any other champion anywhere who has garnered more gold in one federation on the independent scene than Shawn Blanchard. In addition to the six reigns, he has held tag team championship three times and a two-time Tri-State champion. He was inaugural Joe Abby Memorial Tournament winner in 2008 and the first Battle Bowl in 2009 (he won it a second time in 2013). Blanchard has faced Demolition Ax, Bushwhacker Luke, and has won titles while seconded to the ring by Studio Wrestling stalwart and VIP Advisor Frank Durso as well as the leader of the Four Horsemen, James J. Dillon. No wrestler anywhere can make a similar claim. The second façade on the mountain would belong to the self-proclaimed “Face of Pittsburgh,” Lou Martin. For the entire KSWA run, “Dr. Devastation” hasn’t been far from the spotlight. He is the only Megastar aside from Blanchard to hold the top championship in the KSWA more than one time (he is a two-time KSWA Champion). He recently won the Golden Triangle Championship for the second time, some 15 years since he won it the first time. Martin is a four-time tag team champion (three with fellow VIP Blanchard and another with Starr), a one-time Joe Abby Memorial Tournament conqueror and the most recent Marion Ferraro, Sr. Memorial Tournament winner. Despite being a mean competitor with a penchant for “Garbage Pants,” Martin is a philanthropist and charitable leader in Pittsburgh and beyond. It was all of those qualities that lead Martin to be named the “Number One KSWA Megastar of All Time” in a groundbreaking and oft-imitated 2014 series. For nearly 40 years, Lord Zoltan has been an institution, a hesitant “legend” in the world of independent professional wrestling in Pittsburgh and beyond. “His Lordship” has wrestled in countless organizations, federations and companies since the 1970’s, but since 2009 his “home” has been the Keystone State Wrestling Alliance. First a grievous rule-breaker, the devious Zoltan plodded to the ring accompanied by the theme from “Phantom of the Opera.” With a darkened hall and eerie music, the fans were mesmerized. Then on June 11, 2011, Zoltan (after a brief absence), Zoltan arrived as a surprise entrant in the “Ultimate Survivor” match. Instead of helping Blanchard and Martin, Zoltan turned the tables and assisted Justin Sane’s team. He won the Ultimate Survivor match for Justin’s team and joined the zany Megastar on July 2, 2011 to win the KSWA World Tag Team Championship. The duo would defend 15 times and hold the straps for 75 weeks. Since that time, Zoltan has won dozens upon dozens of matches and won the seventh annual Joe Abby Memorial Tournament in 2014, with Pittsburgh Mayor Bill Peduto nearly at his side. Zoltan, who has mentored and assisted hundreds of wrestlers and wrestling personalities in his career, recently faced off against the Honky Tonk Man and teamed with Doink the Clown in the KSWA ring. In the Top 35 KSWA Megastars of All Time, he was the highest-ranked wrestler who has never captured the promotion’s top prize. Lord Zoltan remains an institution, in and out of the KSWA ring. Immensely popular to this very day, not many Megastars have had the pure charisma and magnetism of The Latin Assassin. His first KSWA match was on September 16, 2000 when he lost in a six-man tag team match with Blanchard and Martin. His second match would be on October 28, 2000 when he lost to Blanchard, who was defending his first KSWA Heavyweight Title. Latin would win the Golden Triangle Championship on October 4, 2004. Latin Assassin won the Tri-State Title in 2005 and 2006 before an injury would force him to relinquish that championship. He would be the last Tri-State title holder as that belt merged with the Golden Triangle championship on August 26, 2006. Latin served as Kommissioner in the KSWA and was a ringside difference maker at FanFest 2006 when he helped keep Frank Durso away from the ring when La Lucha bested Blanchard for the KSWA title in front of the largest and most ruckus crowd in the promotion’s history at that time. He would heal from back surgery and win the KSWA Tag Team belts with the Blood Beast twice in 2008. They served as fighting champions well into 2009. On May 1, 2010 he won the most prestigious title in the commonwealth when he defeated Blanchard. Latin would hold onto the belt for nearly a year and successfully defend the belt nearly a dozen times over that stretch. Injury would stop his upward trajectory again years later. His last match was on June 15, 2013 in a tag team victory with Jack Massacre. These are just some of the reasons why The Latin Assassin is the fourth feature on Mount Keystone.